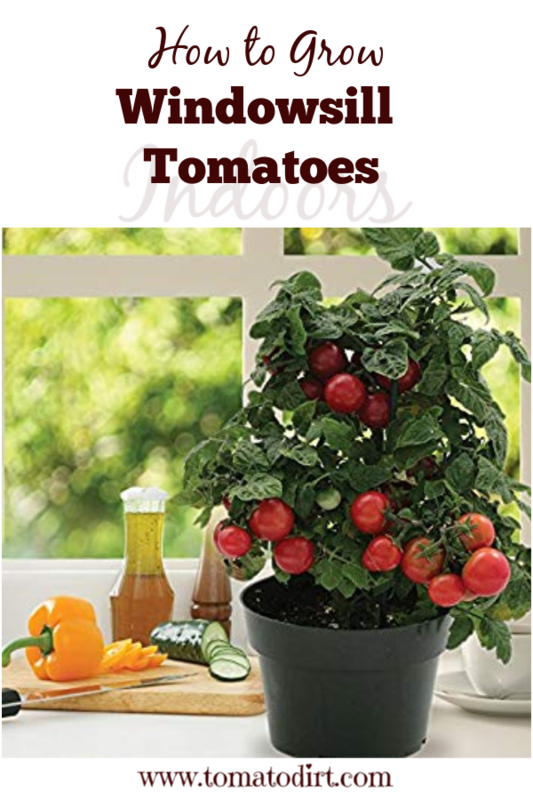 Windowsill tomatoes are the easiest and most economical way to grow enjoy fresh tomatoes indoors all winter long. 1. Choose tomato varieties that have a reputation for growing well indoors. 2. 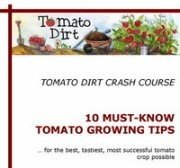 Start seeds 10-12 weeks before you want to harvest tomatoes indoors. For example, plant seeds in August to begin picking tomatoes in December. 3. Follow the same seed starting process to for indoor tomatoes as for growing tomato seedlings in the spring. Fill seed cell trays with moistened potting mix. Make sure container bottoms have holes for drainage. Use a pencil to poke a small hole in each cell or container. Plant seeds with a tweezers or pinch seeds between your fingers. Cover holes with pinches of extra moistened soil. Label planted seeds. Mist your planted seeds with a spray bottle filled with water. 4. Tomato seedlings will emerge in 5-10 days. Check seedlings daily. Mist or water them regularly. 5. Tomato seedlings will emerge in 5-10 days. Check seedlings daily. Mist or water them regularly. 6. Once plants have 2 sets of leaves, re-pot them to 4" transplant pots to help them build a strong root system. 7. After a couple of weeks, move seedlings to indoor planters. 8. Choose the largest container possible to allow the tomato plant to grow and develop all winter. Bury the stem to encourage extra root development. 9. Place a saucer beneath pots to catch drained water that drains through containers. Which windowsill is best for your tomatoes? Set them in your sunniest window – one that allows a good deal of natural light, such as a bay window, picture window, or floor-to-ceiling window. If possible, choose a window facing south. Give tomatoes consistent light. Plants need 12-18 hours a day. Turn plants each day so that all branches get an even amount of light. When days get short, watch to make sure plants don’t get leggy. If plants begin to look weak, consider setting them beneath grow lights. Give tomatoes consistent heat. Tomatoes do best when room temperatures are between 65º-85ºF. If your air temperature falls below that, or if you keep your house cooler overnight, set plants on a seedling heat mat or use a space heater to keep their area warm. Keep tomato plants away from drafts. Water regularly. Check soil daily to keep it evenly moist. Help with pollination. Outdoors, tomato plants get pollination help from insects and breezes. Indoors, they need a hand. Tap stems each time you water plants or use a fan to move air and help pollinate blossoms. Fertilize. Tomatoes grown indoors are like patio tomatoes in that their roots cannot reach deeply into the soil. They feed on only what you give them. Well-drained containers mean nutrients leach out into saucers. Feed your indoor tomatoes every 10-14 days with a balanced tomato fertilizer such as Miracle Gro Tomatoes or Tomato Tone. Pinch suckers to direct the plant’s energy focus on its main stem. Keep your eye out for pests. The most common pests on indoor tomatoes are aphids, spider mites, and whiteflies.